After years with no government backing, the Israeli diamond industry has entered a new era. 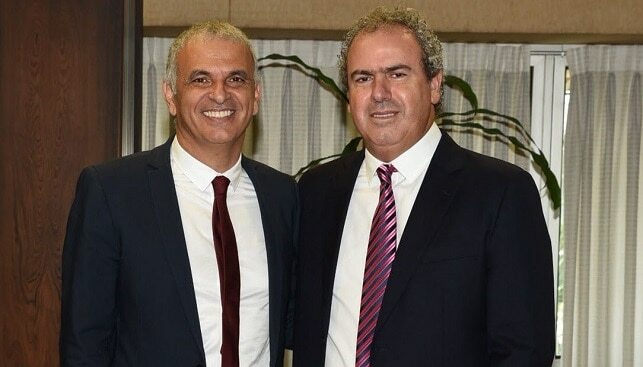 That was the message brought by Israel’s Minister of Finance, Moshe Kahlon, when he visited the Israel Diamond Exchange (IDE) today for a New Year celebration on the bourse trading floor. “The relationship between the government and the diamond industry was in need of improvement”, Kahlon said. “President of the Israel Diamond Exchange Yoram Dvash and I have brought this relationship onto a positive path. Together we have worked out a program to assist the industry in many of the challenges it faces”. Kahlon added, “The diamond industry exports in the billions of dollars and provides jobs to thousands. It is what every Minister of Finance wants to encourage, and we want the diamond industry close to us. There’s still a lot to do and we will continue to work together”. A direct result of the new relationship is a groundbreaking campaign, “Fly to Buy”, announced by IDE President Yoram Dvash at the event. This campaign, which will run from October to December 2018, will enable diamond buyers to fly to Israel for free, if they purchase $150,000 worth of diamonds during their visit to the exchange. The cost of the flight will be reimbursed up to $1,000. Dvash said that the government had committed to providing more than $4 million to finance the industry’s marketing efforts over the next five years. “This is an unprecedented gesture of support for the diamond industry, and a major boost for us in these challenging times,” Dvash added. On his Facebook page, Dvash stated that “the Israeli diamond industry will receive 3 million NIS every year from the government to support the industry’s marketing efforts in the world. The decision was made by an interdepartmental committee which submitted its conclusions several months ago”. The IDE President added: “We have decided to allocate most of the funds for the benefit of our bourse members, and what’s better for business than buyers coming from all over the world to meet our bourse members and close deals?”. Dvash explained that “the necessary prerequisite for diamond buyers to receive free flights to Israel is a daily presence in the IDE’s Trading Hall, with the aim of maximizing the chances for doing business with bourse members”. “I am certain that this move will energize the trade and bring many buyers to our bourse. It is the first step of many we intend to take in order to utilize the governmental funds”, Dvash concluded. Foreign buyers can register here.